Lithonia Lighting LBL Series Low-profile 32.4-Watt LED wrap-around fixture in high-gloss, high-reflectivity baked white polyester enamel finish, features code-gauge steel construction. The acrylic linear prismatic diffuser creates soft light to the surrounding. This curved basket fixture has 80 CRI 4000-Lumen 4000K LED lamp that has voltage rating of 120 - 277-Volts. It measures 48-Inch x 10-Inch x 2-3/4-Inch. This fixture undergoes multistage iron phosphate pretreatment ensures maximum bonding and rust inhibitor. 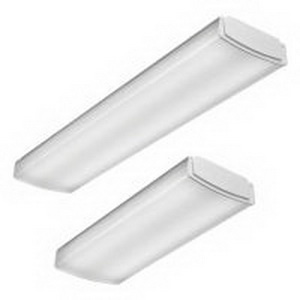 The LEDs of this fixture coupled with high-efficiency drivers provide superior quantity and quality of illumination. This fixture has average life span of 50000 hours. It is suitable for closets, storage rooms, hallways, stairwells and office. Fixture is CSA certified and meets US and Canadian standards.